All researchers, fisheries scientists, fisheries students, administrators and libraries in universities and research establishments where fish and fisheries are studied and taught will find this book a valuable addition to their shelves. Commercial and sports fishermen will also find Fish Catching Methods of the World a fascinating and vital reference. Otto Gabriel is the editor of Von Brandt's Fish Catching Methods of the World, 4th Edition, 4th Edition, published by Wiley. Klaus Lange is the editor of Von Brandt's Fish Catching Methods of the World, 4th Edition, 4th Edition, published by Wiley. Erdmann Dahm is the editor of Von Brandt's Fish Catching Methods of the World, 4th Edition, 4th Edition, published by Wiley. 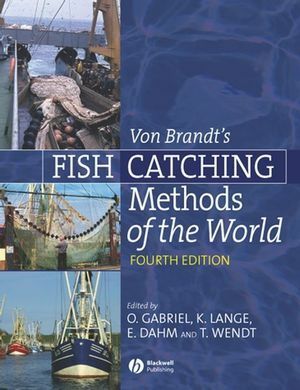 Thomas Wendt is the editor of Von Brandt's Fish Catching Methods of the World, 4th Edition, 4th Edition, published by Wiley. Catching methods in fisheries; an introduction. Animals as a help in fisheries. Spearing, harpooning and shooting fish. Fishing with clamps, tongs, rakes and wrenching gear. Line fishing: gear and methods. Fishing for sport and recreation. Attracting, concentrating and frightening fish. Net material and the art of net-making. Mechanical fishing gear: traps, lines and snares. Cover pots and cast nets. From the scoop basket to the stow net. Trawl fisheries in three dimensions. Seining in fresh and sea water. Fish shoals and surrounding nets. Fishing systems and harvesting machines. Fishing effects on fish stocks and environment. A.2 Main groups of catching methods. "For those not familiar with the incredible range of gear types and fishing methods being employed, the book should hold a great deal of fascination." "This is a classic and most comprehensive reference available in this very wide subject. It was first published in 1964 and this is the fourth edition...it is undoubtedly a useful book and the best available."